It's sleek and speedy, but has Sony released something exciting? When Sony announced the Xperia Z3+, many of us hoping for the Xperia Z4 were disappointed. Instead of getting a brand new flagship device with exciting new bells and whistles, we were presented with an iterative update that seemingly only brought a few updates and improvements. While these improvements are certainly welcome, it's no secret that Sony's mobile division is turning in disappointing results – and a new flagship Xperia could have been the shot in the arm the company needed. To be fair, Sony could have simply called this device the Z4 to help drum up some more excitement, but by naming it the Z3+, the Japanese company appears to be managing expectations. These aren't the most auspicious of circumstances for a new handset to launch in, but does the Z3+ overcome its challenges and emerge as a fine handset or is it doomed to be overlooked by the same audience who gave the Xperia Z3 a miss? While I liked the Xperia Z3 when it was first released, the ageing flagship has since been surpassed by a new generation that include the Samsung Galaxy S6, HTC One M9 and LG G4. A hardware refresh and a few new features have at least allowed Sony to remain competitive without launching a whole new flagship. However, with a new handset comes a new price tag. While the Z3 sells for about £320 ($498 and AU$675) or with monthly contracts as low as £23, the new Xperia Z3+ costs about £415 ($645 and AU$875) SIM-free, and is free with monthly contracts of £45. That's a pretty big difference, and it means the Z3+ has to prove that it's enough of an upgrade to warrant the additional cost. It doesn't help that the Z3's price drop has helped make the older handset a more attractive sell. If you skip the Z3+, it's now cheaper than ever to get a Sony flagship device. If you do want the new model, it's at least slightly cheaper than the LG G4, and a fair bit less than the Galaxy S6. 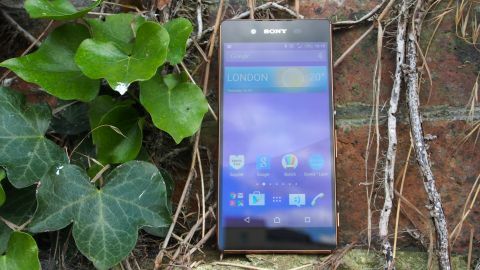 Sony has a well-earned reputation for creating attractively designed products, and the Xperia Z series of handsets did nothing to dispel this, with the OmniBalance design providing an elegant aesthetic that feels comfortable no matter how you handle the device. Sony has kept the OmniBalance design with the Z3+, leaving you in no doubt that this is a high-end Xperia device. Its recognisable design looks a lot like the Z3, but there are a few noticeable changes. For example, although the Z3+ has the same height and width dimensions of the Z3 (146.3 x 71.9mm), it's also been on a bit of a diet, and now comes with a depth of just 6.9mm. This makes the Z3+ lighter and easier to hold than its predecessor, though it comes at a price as the battery has been cut to 2900mAh (down from the Z3's 3100mAh). I'll test out the battery life later on to see if this reduction in capacity results in a noticeably shorter time between charges, but from looks and feeling alone, the slimmer Xperia Z3+ is a big improvement over the Z3. The thin bezels on either side of the screen help make the Z3+ feel comfortable to hold and use in one hand, and it also ensures that the bright, vibrant and full HD 5.2-inch IPS screen is the centre of attention. The bezels above and below the screen are still a little chunky for my tastes. Unlike the Xperia Z3, whose top front-facing speaker and microphone on the bottom were clearly visible in the middle of the bezels, the Z3+ is far more discrete. This is very nice from a design standpoint, but it does make the now mostly blank bezels (especially the bottom one) seem slightly redundant. Like the Z3, the Z3+ remains a slab of glass with a metal surround, though this time the sides of the phone have a shinier and more expensive look. It's enough to make it easy to tell the difference between the Z3 and Z3+ quickly when they're side by side. The Z3+ is also waterproof, and while some ports need to be covered in slightly fiddly flaps to remain water resistant, Sony has managed to make the microUSB of the Z3+ waterproof on its own. This new feature was particularly pleasing because it meant I didn't have to locate and prise open a flap every time I wanted to charge the handset. With the Z3 and Z3 Compact, I would often find myself scrabbling around to find the flap when plugging in the phone in the dark – so the lack of a flap (and it's repositioning at the bottom of the handset) is certainly welcome. Rejoice! There's no longer a flap over the microUSB port! That's about as convenient as charging gets, however, as the Z3+ doesn't support wireless charging, which is being increasingly spotted in other flagship handsets. Perhaps Sony will include it in the Z4?